Can you be creative, innovative and inspirational, and well structured, logical and organised at the same time? Many people think that the two don’t really go together, or worse that they absolutely can’t co-exist. The notion that the creative brain, the freedom to think differently and the random flowing of ideas will somehow be stifled by any kind of logical system around it. I kind of know the feeling – I want to spread all my ideas out using brightly coloured pens on a flipchart. Big picture, slightly scrawly, constantly changing. I don’t really want to squish it all into a spreadsheet. It feels slightly wrong, like my ideas will die. Somehow trying to create regularity around irregularity might damage the essence, the heart of the bouncing, jubilant little gems. Doing things “normally” is something of a fear amongst super creative types. 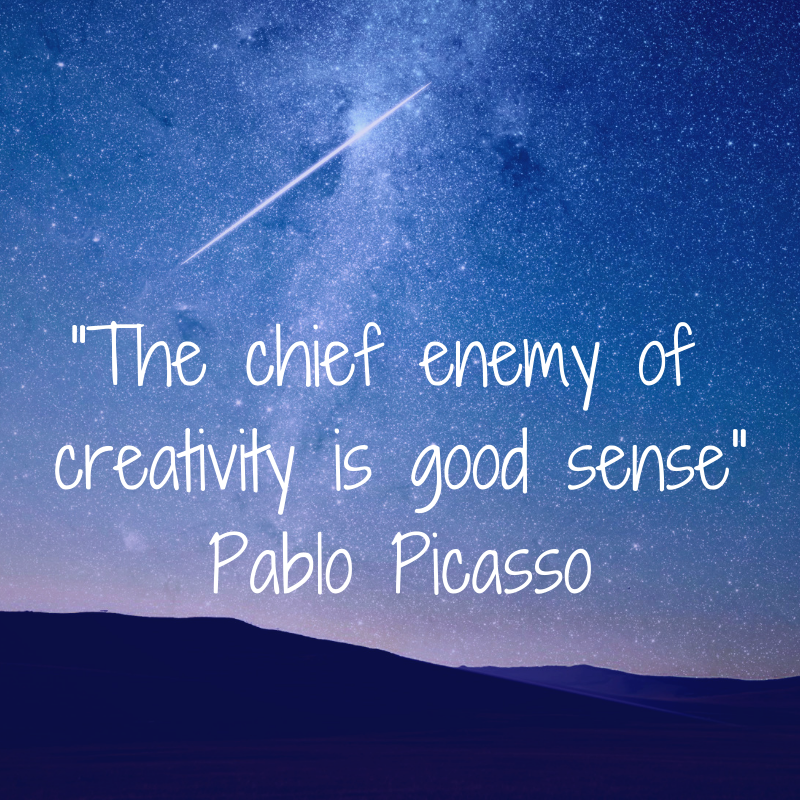 As Pablo Picasso said “The chief enemy of creativity is good sense”. Conforming to the idea of order and logical straightforwardness is something to almost battle against in the war of not wanting to be like everyone else. Of course it’s more than not wanting to comply, it’s about challenging, and developing and inspiring. Doing things not just differently, but better. But actually for ideas to become anything more than simply an idea, they do need some kind of focus. Whether focus and good sense are the same thing I’m not sure, but there needs to be something next to be able to turn the ideas into something real. There needs to be a moving forwards from creation to innovation, adding focus to creativity to make an idea a reality. As a group facilitator I often get asked by groups of people whether internal teams, or external stakeholders to help brainstorm ideas. These kind of sessions focus on encouraging people to come up with new ideas, to solve problems, and to work together by harnessing that collective brainpower, to generate ideas. But generating ideas in itself is not nearly as productive as working out what to do with them next. That’s the fun part – producing the next steps and the plans to move the ideas forward. That’s where I like to really get stuck in. Some companies spend huge amounts of time and energy trying to get creative, to be innovative and to do things “outside the box”. Even amongst the most corporate of entities there is a realisation that it order to survive there need to be new ideas and new innovations. But playing with lego in your lunchbreak and bringing in funky beanbags won’t really scratch that itch, there is a bit more to it than that. Trying to add some creative zing into some companies is a lot more than a regular ideation sessions where you can brainstorm yourself silly. Creativity is often something more deeply ingrained into an organisation’s culture. But is it more difficult to infuse this into a more traditional workplace, than working the other way around to provide some more robust architecture around a natively creative organisation? There has been a lot written about trying to enhance the creativity in more corporate organisations. So here let’s talk more about inherently creative organisations. Ones that focus more on their ingenious and inventive hearts, and perhaps far less on the processes, systems and structures within which to frame it. If you are already that creative organisation you might very well be full of people brimming over with ideas and busting at the seams to get the latest idea down before it escapes somewhere. You don’t need to be shown how to get creative, or encouraged to think blue sky like, you are already there. You have a team full of people that are fuelled by creativity, keen, motivated and ready to go. By having this type of team, you attract more unorthodox people who hopefully value the same things that the company does. So when ideas and innovation and originality are so sought after by some, and you have it all, what could go wrong? If you are creative enough to have those inspired ideas, and driven enough to take them forward you can really produce something magical. You might have seen the magical thing happen already, and be hungry for more. The thing to take care of, the thing that often scuppers such visionary and inventive organisations is the bit after the initial take off. It’s sustaining the flight, keeping it all going and maintaining it all without burning out all the energy that makes it work. The people at the centre need some support. The problem with being super creative and original and disruptive is that it can actually be pretty exhausting. You need to go with the flow, chase the butterflies and grasp opportunities with both hands otherwise, well who knows, someone else may do it first. Or worse, you end up enormously frustrated because your thing got away from you before you could fully work it out. Innovation relies on a team of people who are equally passionate and enthused by the creative inspiration to really make it work. But the team can’t keep going on a system of creative energy and drive alone, even if in the moment that is actually quite a prized state. There is a very real adrenaline buzz associated with the fast paced and exciting world of constant creativity. A real dopamine hit. But there does need to be some kind of processes, strategy and system to keep it all going. Great ideas can’t exist in a vacuum and however important disruption and organic originality may be to the creative process, ideas and innovations are vulnerable if they don’t have some kind of support around them. This doesn’t have to mean tight control and rigid structures. It doesn’t mean you have to use traditional forms of hierarchical organisational structure and formal meetings and key performance indicators. It doesn’t mean you have to have heads of departments and form filling and business strategy documents coming out of your ears. You don’t have to embrace the phrases “moving forwards” and “traction” and “leverage”. You are the creatives, make things the way you want then, and use the language that suits you. It is about developing a structure that is right for creative minds to thrive, something that makes sense. And whatever system of doing things and structures you choose, however you design it and whoever is in it, it’s important for some level of consistency and clarity so that the right people are in the right place to do the right things. Some of the core elements that support a team to enable them to make things happen are the shared values, vision and purpose, consistent ways of doing things and the right mix of people. Creating some clarity around the way things are done and the way the team communicates with each other for example doesn’t have to exist in a rule book. Lines of responsibility and accountability, and the make up of subteams or working groups all help people to know who’s doing what. Having defined roles help everyone to know what is expected of them, but it doesn’t mean that people can’t be proactive and step up when they’re needed to, to instinctively react to a situation if that is part of the company culture. But it does mean that there are some boundaries to protect people. It might just be a case of imagining things differently, or it might be about creating some straighter clearer lines from the wiggly ones (rather than drawing new lines altogether). I helped a hugely creative team recently to look at the systems and structures within it. In the workshop I facilitated I used the Mackinsey 7s to help delve into the style, skills, structure, systems, shared values and staff and strategy of the organisation. And to fit with the organisation’s creative organic ethos, we imagined this as a tree. We didn’t use a spreadsheet, we used flipchart paper, but we had a template to contain our ideas. It’s about developing things to fit you rather than the other way around and creating something that is as fluid and dynamic as the ideas. People are probably the heart of your organisation already, and their belief in what the company does is the essential glue, crucial for holding things together. But it’s important to check in with people, enabling those values and beliefs to be defined and articulated and to make sure they are aligned. It’s easy to imagine that everyone is on the same page and that because you are working for a really inspiring organisation you are all working in the same style, or at least complimentary styles. Some people might want to do things differently and sooner or later there may be people who want to break the mould, to do the thing differently again. So defining the thing, creating a focus for people to know where they are heading is hugely important. It’s good to know the rules you are breaking, good to know which values and purpose you are deviating from in the first place and good to know when things change. Which is why it is useful to create the time and the space to draw on the knowledge, experience and ideas of your team. Doing this in a collaborative and nurturing environment is a core part of group facilitation and something that I have done with creative teams many times. It’s not that ideas and new ways of working need to be thought up, these are often in the ether already and there are invariably several people in the team who have solutions to challenges, and ideas for how to move forwards. It’s more about capturing and directing the plethora of thoughts, wishes and feelings, together with more concrete ideas of how to make things work better. Coming to a consensus is not always easy when there are so many points of view, but you can create a best fit that you can develop. It’s also about allowing the team to feel like they have come up with their own ways of working, so that traditional corporate systems are not thrust upon them in a way that will feel unhealthy. This is a bit more than having a say, but actually being listened to and maybe contributing on things that are not just part of people’s jobs, but gained from other experience too. It’s also about realising that there are structures in place already and there are already ways of doing things – but the mapping out and making these explicit is often an important part of the discussion. So to answer the question about the co-existence of creative spirit and logical structures, absolutely they can co-exist, if they are built in the right way. 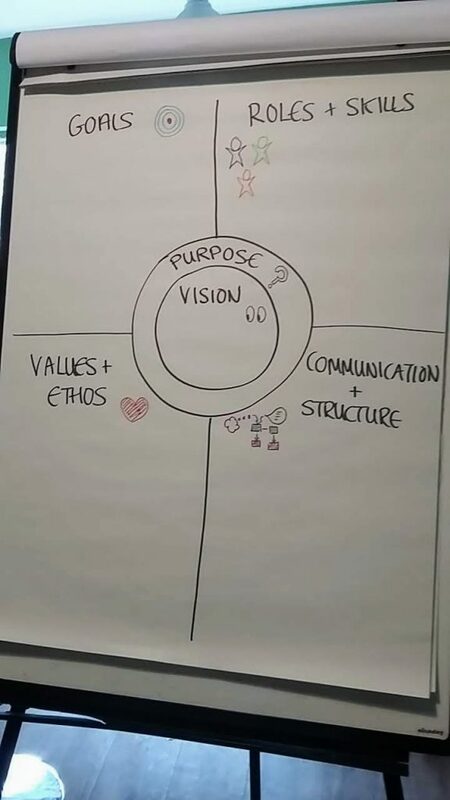 Putting the team in the middle (where it probably already is) and developing something to fit, to define team purpose so you can be sure of your why, and defining the values that surround this is a good place to start. You can also work with your team on your shared vision and the things that you want to achieve on the way to realising that. 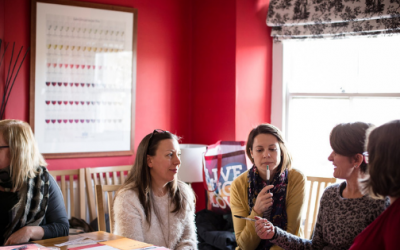 It’s helpful to take a look at the ways of working (the meetings, the ways you communicate, where you write up information and store date for example) and the skills and capabilities of your team and how they work together. There are lots of other aspects to focus on too, but these are some things to think about when involving your team to create the supporting structure that you need. 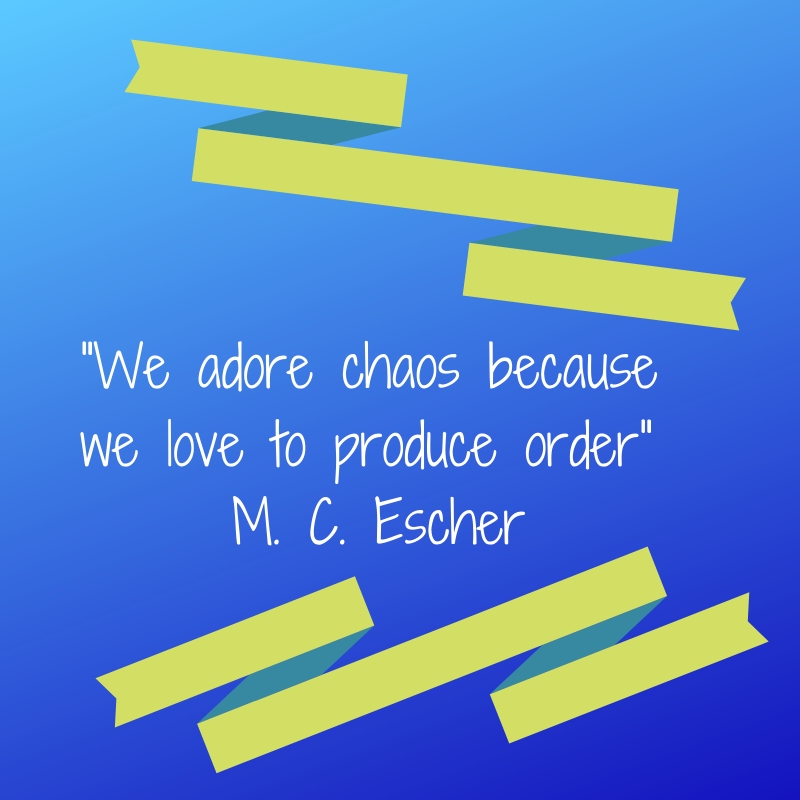 And while I do love Picasso, I came across this quote from Escher which I will leave you to ponder!